This intimate European-style lodge offers an elegant lobby, luxurious hotel rooms and suites, outdoor hot tub, steam room, exercise room, massage services and the gourmet Cafe Kandahar with an extensive wine list. Be enchanted by our friendly staff. 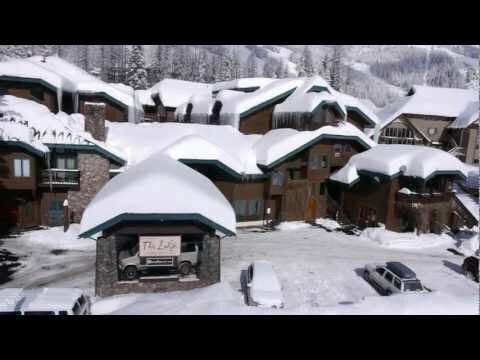 Ski-in location at Whitefish Mountain Resort and 1 hour from Glacier National Park. Open summers from June to September and during the ski season. The Village is located seven miles above the lovely town of Whitefish on an all-weather paved road. Nestled among the pines, the Lodge is a year-round haven providing a rustic yet elegant charm. Enjoy the perfect balance between modern convenience and traditional elegance, between the warmth of a mountain retreat and the friendly service you would find in a European inn. The award winning Cafe Kandahar serves gourmet dinners. The cuisine is described as thoughtfully constructed and inspired by classic and modern influences. The Snug Bar offers evening refreshments. The spacious lobby with its massive rock fireplace is a favorite gathering place. A wellness center located directly behind the hotel has an outdoor hot tub, a steam room, an exercise room and a massage spa. The Lodge has a total of 50 rooms, most of which are hotel rooms with queen beds. Third floor rooms have lofts. 16 of the rooms have kitchens. The rest of the rooms have microwaves and small refrigerators. There is no elevator. The lodge is a non smoking facility. Pets are not allowed. All rooms are air conditioned. Kandahar Lodge offers a premier location in the winter as guests ski into the hotel and take a short walk to the Home Again trail to ski out. In the summer, the Lodge serves as a perfect base camp to hike, bike, ride a zip line or alpine slide, to explore Glacier National Park one hour away, to golf the spectacular Flathead Valley courses and to recreate on the abundant lakes, rivers and creeks. Anytime of the year, it is the perfect place for small meetings, seminars, retreats, reunions, weddings and bus tours. Treat yourself to this refreshing alternative to everyday chain motels and hotels. Great summer destination. Lots of food choices and activities. I hiked the superb trails. Lots of mountain bikers were fun to watch and chat with at the pubs. Pretty good opportunities for good beers at several locations on mountain. Great views! Delightful hotel, beautifully landscaped with helpful folks at desk, nice hot tub and meeting rooms for presentations. Stayed August 2014, traveled with friends. My husband and I stayed five nights at Kandahar Lodge in February 2014 and loved it. Our room was on the 2nd floor and was a nice size with warm decor and was quite comfortable. The staff were always helpful if we had a question, and every morning they gave us and our skis a ride over to the bottom of Chair 2 in their van. We were able to ski in to the back of the lodge at the end of each day and store our skis and boots in the rooms for those before going upstairs. The lobby was beautiful with a fire going in the fireplace all the time. True, there is no elevator, but the stairs are not bad. True, the wireless connection was not reliable, but we were there to get away anyhow. Bring earplugs so you don't hear noisy guests coming down the hall late/early. We did not try the continental breakfast at all so can't comment on that. Note: Cafe Kandahar is fabulous for dinner (pricey but elegant, delicious, and not to be missed)! 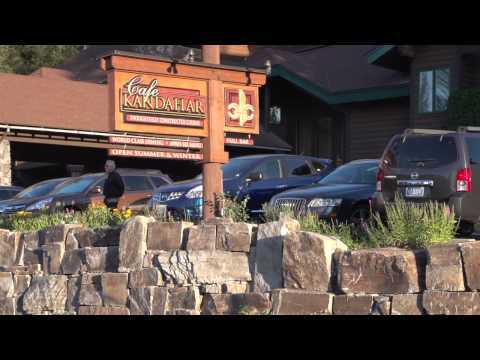 Kandahar Lodge is a beautiful mountain lodge situated in an alpine setting at the Whitefish Mountain Resort. The village area is 7 miles above the lovely town of Whitefish on an all weather paved road. Follow Highway 93 to Whitefish, then follow the green signs in Whitefish to Whitefish Mountain Resort. There is a flashing yellow light at the turn onto Big Mountain Road (MT 487). It is 5 miles to Kandahar Lodge. The Lodge is on the left side of the road.